The other half delivered organic milk to this new cafe/market called Finch’s Market in Strathcona and immediately came home and told me that I would be in love. He’s not wrong. The second location to Finch’s Cafe on Pender in Gastown, this cafe in an unassuming neighbourhood is very quaint with organic goodies, coffee and crazy good sandwiches. 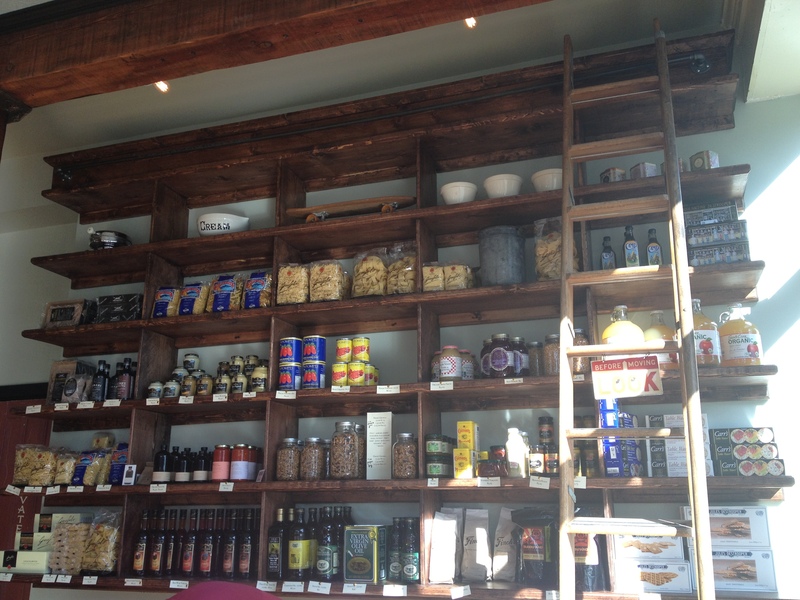 As soon as you walk in you see a lovely floor to ceiling wooden shelf filled to the brim with delicious pantry items from pasta to house made granola. A library styled ladder is attached for presumably easy access to the top shelf and charm. How I wish I lived somewhere that I could install this wonder, how good would my preserves look on this shelf?!?! It was a lovely sunny day which enhanced all the wood in this little cafe but also made it a million degrees inside even with the door open. 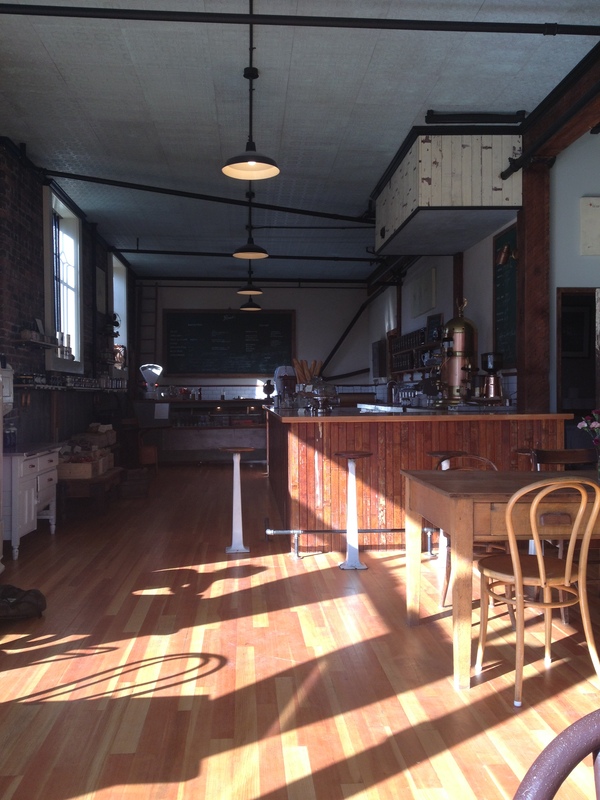 Mismatched tables and chairs, sleek stools at the coffee bar and more pantry items in mason jars line the walls. But most importantly, how is the food? I ordered a prosciutto sandwich with edam. Oh and an Aranciata which to me is just the grown up version of Orangina. Could this be any cuter? Cucumber water in a mason jar (yes please!) and a beautiful sandwich on a crispy, chewy baguette stuffed to the brim with salty prosciutto, big slices of tomato, frilly lettuce and drizzled with balsamic vinegar. It artfully came on a large sheet of craft brown paper instead of plate which for some reason made it seem really darling. That there is what all sandwiches should look and taste like, mondo fresh, great colours and big, because I’m always hungry. Finch’s Market is not really the type of place that is easy to swing by as I don’t live in that neighbourhood nor is there anything really close by but it does seem like sort of a hidden gem and I am sure to keep it in mind whenever I’m craving a cozy corner and a good sammie. Guu with garlic doesn’t have a mega huge lunch menu but at least they are open at lunch which some of the other locations are not. 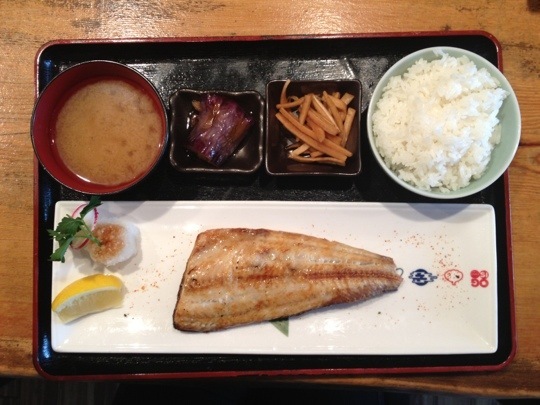 With a smattering of selections I decided to go with the grilled white mackerel fish with rice. I love sitting at the bar when I’m eating solo and especially love watching. the bustle of the chefs. I got a great view of the kitchen and was impressed by all the multi-tasking which included tons of mini cleaning in between. Man was I surprised at the size of my lunch! Half of an entire mackerel fish grilled so the skin was extra crispy (in fairness I watched and it was not grilled but broiled but who cares right?) A bowl of steaming miso soup, rice and a few sides of eggplant and pickle radish. Everything was piping hot and the best part is that is was only $8.90, such a good deal for something so tasty and fresh! We used to live so close to the famous Vij’s restaurant in south Granville but we never managed to venture out there. One fine summer day, we made a beeline to go there to celebrate our new apartment and stopped at Rangoli first. It was a mixture of wanting a lot of food and that there was no wait so in we went and sat on the patio. There’s always something quite beautiful about metal beverage containers like the copper water pot above. It almost instantly transports you to another world. We asked the waiter if the main dishes were large and he said they were good sizes. He was right but hungry people like us ordered three entries…teehee! Our first dish was the braised shortribs. Super tender, fall off the bone short ribs were drowned in a Kalonji curry sauce. On the side came these wonderful pickled veggies that contrasted the richness of the meat well. We kept on dipping the naan back into the curry! Our second dish was the portobello and red pepper curry on paneer. I’ve come to love vegetable curries in Indian cuisine because they are usually coupled with creamier curries and are complex in flavour without all the heat. The portobellos sucked up all the flavour and delivered a burst full of goodness in your mouth. Pickled beets on the side were sweet, tangy and earthy. The last one we ordered was the goat and jackfruit…ummm….so we scarfed it down before I managed to take a photo of it. Oops! There was a coconut cabbage salad that came with it that was very interesting. Besides all the wonderful main dishes, I highly recommend getting the chai too. It’s creamy, sweet and not overly spicy and just plain wonderful! Our good friend invited us to lunch one day in Gastown and he recommended that we head to Meat and Bread, his new favourite lunch spot. 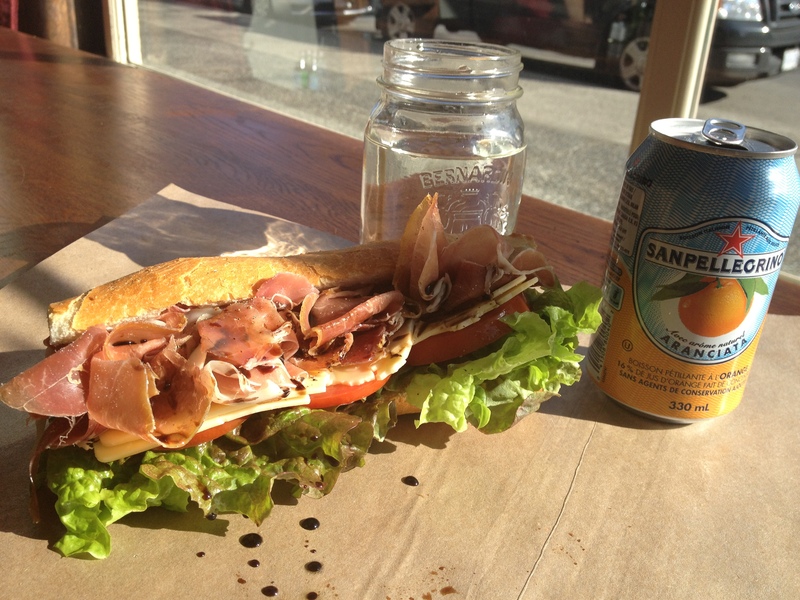 Located on Cambie at Cordova, this place is only opened at lunchtime and seems to be always bustling. First impressions was that this place was run by guys. Only a handful of menu items keeping it real simple to order, a large communal table and an assembly line way of putting together the food. A large blackboard shows what’s available for the day, a few sandwich options with some tasty sides. The star of the show is the porchetta sandwich (pictured above). A big hunk of Pemberton Meadows Beef Chuck is carved by a guy as orders come in. It’s then finished off with Hoisin Glaze, Sesame Cabbage Slaw Pea Sprouts, and Sweet Soy Mayo for $8.00 on a ciabatta bun. Not the cheapest sandwich out there but it’s quite tasty and filling. The side of the day was a fresh tomato and cucumber salad that was nice and tangy for $4.00. The special that day was butter chicken served with a dollop of housemade mustard. 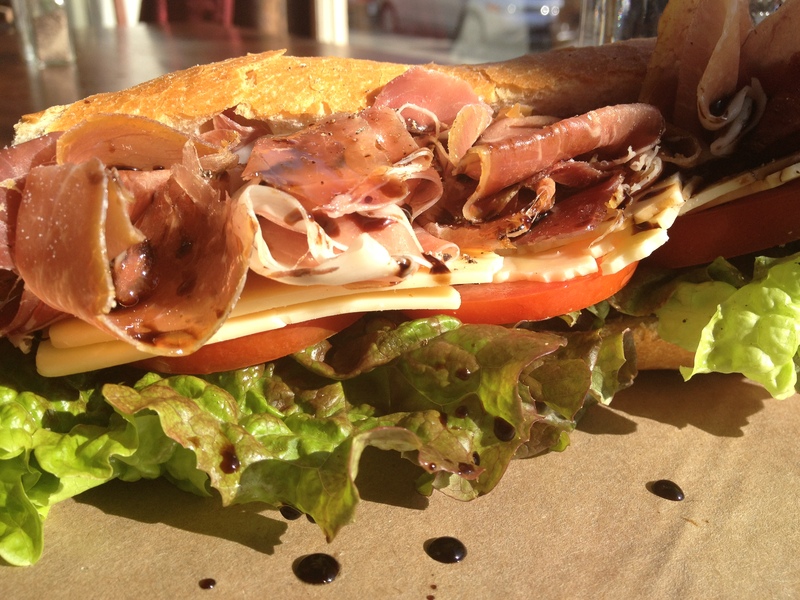 Each sandwich comes on a cutting board adding to the rustic charm of this joint. Tender chicken with some red onions and arugula made for a great sandwich. We’ve been back a few times because it’s quick, always delicious and satisfying! Apparently only recently opened before this summer, Killer Pizza is one of those unexpected hidden gems that you may or may not walk into if you’re passing by. It screams pizza joint but the advertisements boasts amazing seafood at a great price. Their special outside was a full lobster for $16 with all the fixins which seems to good to be true considering all the pizza pics behind it. It’s a fairly simple layout, not a ton on the menu featuring some pizzas and a seafood dinner section. The decor is retro modern, clean but again kinda awkward in concept. Pictured above was a very lovely Bouillabaise filled with big chunks of salmon and cod fish, mussels, shrimp, and clams all drowned in a nice tomato broth. The menu claims that there is saffron in there although I didn’t detect any, and a splash of white wine in there would’ve made this over the top. At $13 you can’t beat the value, the seafood was fresh, perfectly cooked and the portion was quite large. We had to try one of the pizzas too so we decided on the Killer Shrimp & Mango Salsa, the most unusual sounding one on the menu. Behold the pizza! It’s a nice large size at $11 with some very fresh ingredients. No puny shrimp here, they use the real stuff with a pile of mango salsa and cherry tomatoes in the center. The pizza sauce was a little on the mild side but it was fairly tasty and again, cooked just right. The owner is incredible friendly, the concept is a little off even though the food is really great (and it’s affordable!). We definitely will head back here again and hope they become a staple in our neighbourhood! 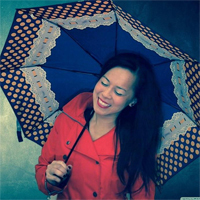 Once upon a time when I first moved to Vancouver, a friend introduced me to Kingyo on Denman. Since then I returned once last year when a friend came to visit from Toronto and have only recently gone back for their incredible lunch bento box. Once you enter the massive doors, you are greeted with a string of Japanese welcoming words from any staff that can see you (even the sushi bar chefs). Dark wood, bamboo center pieces (albeit fake), and bronze accents makes this place moody and comfy at all at once. Our table had a peekaboo glass top revealing metal work and heavy wood grain….sigh…so nice. Now let’s get to the food which really, is entirely the point in coming to this place. I have no idea if this gem is on the menu but the lunch bento box is always fabulous. Did I mention that it always changes as it is a chef’s selection? Did I also mention that they only make limited quantities?!!?!? Jealous table neighbours stared at our 12 dish bento box when it arrived. Breath, take it in, isn’t it exciting? I love variety and I was giddy with delight to see all the different dishes, yes this is a big lunch and at $16 it’s totally worth it. Although the waitress went through all the dishes, we could barely understand her through her thick accent but we didn’t care…we were just itching to try everything! Here’s the breakdown of what was on the menu this time around. Top left: braised savoury sweet fall apart melty short rib in a thickened cream sauce. This little morsel packed a flavour punch that we couldn’t eat it all in one bite. Top right: chicken karage…usually I scoff at this because it’s nothing more than battered deep fried chicken but three generous chunks were found in the bowl and they were ah-mazing. Crispy outer shell freshly fried with juicy dark meat inside…no sauce needed. Bottom left: marinated cabbage, although a little lack lustre, it was a great dish to clean your palette in between. Bottom right: peeled and marinated cherry tomato with bonito flakes…a lovely combination with juicy ripe goodness once you bite into it. Top left: molten lava deep fried tofu, this was a well balanced dish with savoury sweet sauce, a touch of green onion and delicious (and not bitter) tofu. Top middle: negitoro, a mix of chopped tuna belly with green onion, such a generous portion! Taking sheets of seawood, you scoop up the mixture with the wooden spoon and make a little wrap, the fish was uber fresh and not overly mayo-y. Top right: deep fried whole oyster…wowza yum! I usually am not a fan of cooked oysters since they can have a funny kind of texture but with the breaded coating, this was simply amazing, super rich. Bottom right: spicy seared tuna, the right amount of heat, you can really taste the chilis without the burning sensation. 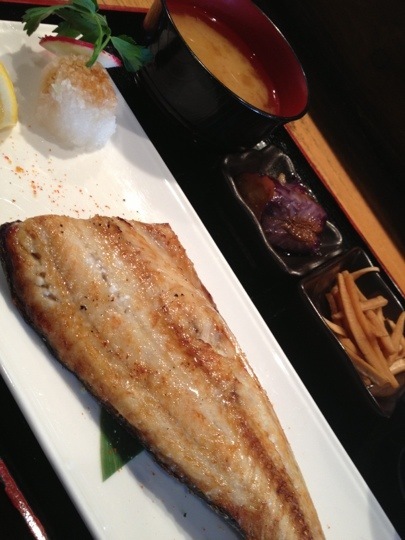 The fish came through the sauce beautifully and as always, super fresh and melty. Love the green onion addition as it added a fresh element. Top left: Egg roll with reduced ponzu and grated white radish. I am not a fan of japanese egg sushi nor did I like this, it’s cold, sweet and weird. My other half scarfed it up though. Bottom-right: gardens salad with jellyfish. Although not entirely creative, the salad was nice and refreshing and I loved the chewy tangy jellyfish on top. The whole shabang also came with a bowl of rice (which neither of us barely touched) and a bowl of miso that was jam packed with lots of tofu, veggies and seaweed. I highly recommend treating yourself to this belly busting lunch bento….it’s my favourite.